LG V30 review | What Hi-Fi? We have some issues with its screen, but this is a great-sounding smartphone. It’s rare to find a phone that feels purpose-built for high quality audio – and even rarer to get one that looks gorgeous at the same time. But LG seems to have delivered both with its new V30 smartphone. It’s a top-spec phone with an uprated DAC that can play hi-res digital files, wrapped in a classy metal and glass chassis. It even has a headphone jack, so there’s no need to mess about with dongles. A screen with skinny bezels and an OLED panel should be the icing on the cake but, while the V30 has some of the best audio you’ll find in a phone, it is prevented from being a complete success by a few issues elsewhere. The V30 features a 32bit ESS Sabre ES9218P DAC, making it one of the best-equipped phones around in this respect. With support for 24bit hi-res files and (a first for a phone) MQA, this is a huge step up from the DAC used by most of its Snapdragon-powered rivals. 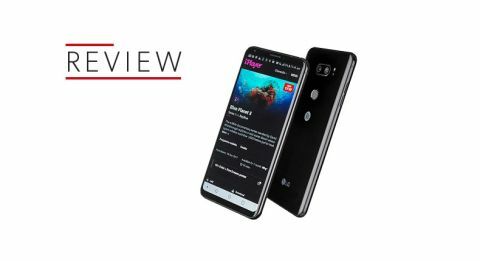 LG used a similar set-up in last year’s V20 and the Korean version of the G6, but neither of those phones received a UK release - so this the first time we’ve been able to give it a listen. The detail on display from an MQA version of Coldplay’s Adventure Of A Lifetime is outstanding, with superb separation between instruments. The acoustic guitar on Fleetwood Mac’s Never Going Back Again has a delightful ambience you wouldn’t expect from a smartphone. The LG’s presentation has a level of clarity, transparency and dynamic expression that leaves rivals from Samsung and HTC in the shade. It’s easily the best-sounding Android phone this year, even if it can't quite match the rhythmic cohesion of Apple’s iPhone X. The overall rhythm can feel a little imprecise, in a way we don't experience with the iPhone X - but by Android standards it’s still very impressive. Last year’s V20 could only toggle the hi-fi DAC on and off, and balance left and right audio channels, but there are more configuration options here. The sound presets are simple software equaliser toggles, but the digital filters are far more interesting and well worth investigating. Perhaps unsurprisingly, the built-in speaker is less impressive. It’s not as loud as the dual-speaker iPhone X, and the placement at the bottom of the phone makes it easy to muffle. But with such great audio through the 3.5mm port you won’t want to listen without headphones. LG bundles a pair of B&O Play earphones with the V30 - they're better than most in-box buds, so you won’t have to upgrade straight away. If you’ve already moved over to wireless listening, however, the V30 still delivers with aptX HD support. While LG’s big-screen OLED panels are the envy (and indeed the default choice) of the television industry, it has mainly used LCD panels in its phones. That changes for the V30, which arrives with a 6in P-OLED display. Unfortunately, it doesn't quite match Samsung’s superb AMOLED screens for clarity and contrast. With the brightness pushed to 100 per cent, colours look punchy and vibrant, while staying on the right side of realistic. The harsh hues of the red planet in The Martian have real impact, but at lower brightness settings it doesn’t have quite the same wow factor. Here, images show much less gradation between shades of colour - especially with shadow detail. This is most noticeable with HDR content, where the V30 should impress. But when playing Marco Polo on Netflix there’s just not enough definition in the darker scenes, even with brightness cranked to maximum. It’s not what you’d expect from an OLED panel, and both the iPhone X and Galaxy S8 cope far better. SDR content fares better on the V30, suggesting these issues are related to processing rather than the panel itself. Hold the phone at an off-axis angle, though, and you’ll spot a noticeable blue cast across the display - it can be distracting. The 2880 x 1440 resolution at least provides plenty of detail for your photos and makes even small text legible, while the 18:9 aspect ratio means you can comfortably run two apps side-by-side in landscape view. LG’s approach to dual-lens cameras is different to its rivals, focusing on wide-angle photography instead of background-blurring portrait modes or zoom. The V30 is no different. The main camera uses a 16MP sensor, with an extra-wide f/1.6 aperture. This is paired with a 13MP secondary sensor with an f/1.8 aperture and wide-angled 120° field of view. However, it lacks the optical image stabilisation of the main sensor and doesn’t cope as well in low-light situations. While there’s no doubt that wide-angle lens fits considerably more into every photo, the quality doesn’t match either Samsung’s Galaxy S8 or the Apple iPhone X.
Colours look natural for the most part and there’s very little image noise to make your shots look grainy, but the V30 often struggles with complex scenes. HDR does a reasonable job of balancing shadows and bright areas, but it still leans towards over-exposure. Sharpening is an issue, too – something previous LG phones have been guilty of. Heavy processing strips back detail, while boosting the edges to give the appearance of a crisper image. It works on the phone screen, but doesn’t look as good when you zoom in. Among flagship phones, the quality is merely average. LG claims the V30 can shoot movie-grade video, thanks to cine-log format recording letting you colour-grade your clips in an editing suite later. However, enabling this mode restricts your footage to 1080p shooting at 30fps. The Cine Video presets and target-based zoom let you apply realtime filters to your footage and smoothly zoom into a focus-locked target (instead of just zooming into the centre of the frame). It might still be using digital zoom, but the effect is undeniably more cinematic. The V30 has all the hallmarks of a 2017 phone. Built from glass and metal, with skinny screen bezels and curves in all the right places, it looks every bit the high-end phone – if not quite as impressive as Samsung’s curved Galaxy S8. It doesn’t have to make room for front-firing speakers, like Google’s Pixel 2 XL does, so it fits more comfortably in your hands. That 6in screen makes it quite sizeable, though the fingerprint sensor sits in a sensible location on the back of the phone, right where your index finger naturally rests. Water-resistance is another welcome inclusion. An IP68 rating means it will survive down to 1m for up to 30 minutes. Unfortunately that glass construction means that dropping it onto a hard surface is likely to result in a shattered screen. The V30 is a departure for the V-series. It doesn’t have any superfluous hardware – but it does have the option to add something similar with software. A floating shortcut bar puts app shortcuts, music playback controls and screenshots within one easy-to-access location that can be dragged anywhere. That’s particularly useful for anyone with smaller hands, as the 18:9 aspect screen can make it difficult to reach the top. Shortcuts aside, LG’s Android interface hasn’t changed much from the G6. It’s less intrusive than previous iterations, although spreading the Settings menu across multiple tabs can make finding something specific a little fiddly. The V30 launched with Android 7 Nougat, rather than the newer 8.0 Oreo. LG is rolling out an update to customers in its native Korea, though, so a global update shouldn’t be too far behind. There’s a respectable 64GB of on-board storage to hold apps, games, videos and music, but if your music library is full of hi-res files it will fill up quickly. Thankfully there’s a microSD card slot for adding more capacity. The door is open to virtual reality, too. The V30 officially supports Google’s DayDream View headset, which doesn’t yet have as many apps or games as Samsung’s Gear VR - but that number is increasing all the time. LG’s always-on display is far more suited to an OLED display, as it only uses power to draw a small number of pixel, instead of using a backlight to illuminate the entire screen. You get the time, date and any incoming notifications, without having to wake the screen up. A Qualcomm Snapdragon 835 CPU and 4GB of RAM put the V30 on par with most of the other flagship Android phones. That’s a big step up from the last-generation 821 seen in the G6, and means performance is on par with every other phone running an 835, which is very brisk indeed. It helps Android 7 run smoothly, whether you’re scrolling through social feeds, multitasking or playing games. Demanding titles like Asphalt 8 play without any lag, and using two apps in split screen doesn’t slow things down either. This year’s CPU is more power efficient than the outgoing 821, and the 3300mAh battery helps the V30 last an entire day on a single charge – roughly the same as Samsung’s Galaxy S8+ or the Apple iPhone X.
Wireless charging is a convenient way to top up and the Qualcomm Quick Charge 3.0 will boost you back up to 50 per cent in less than an hour if you plug in a cable. On paper, the V30 has the features to make any movie or music fan salivate - but it only fully delivers in one of those areas. An uprated DAC makes the difference to audio, giving it an edge over its Android rivals. However, the OLED screen doesn’t cope as well with HDR video as its rivals. It’s not a bad display, but lacks the impact of the Galaxy S8 or iPhone X. The V30 is quick, takes decent photos and has great battery life - but so do many of this year’s phones. If you want the great sound, you’ll have to accept the downsides that come with this phone.